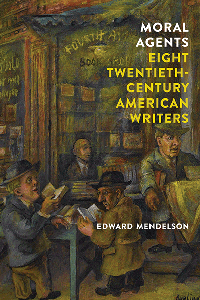 Professor Edward Mendelson joins the show to talk about his new book, Moral Agents: Eight Twentieth-Century American Writers (New York Review Books), which profiles Lionel Triling, Dwight Macdonald, Alfred Kazin, William Maxwell, Saul Bellow, Norman Mailer, WH Auden, Frank O’Hara. We discuss the role of individuals in mass culture, the intellectual’s temptation to be a leader, the outdated figure of the Beloved Professor, Orwell’s misinterpretation of Auden, the writer he was terrified to meet, the failures of identity politics, the purpose of Columbia University’s Core Curriculum, his lack of nostalgia for the era of public intellectuals, the way certain books need a year off from teaching in order to recharge, and more. Give it a listen! We also talk about why he hates one of my favorite novels, why he agrees with my take on Achilles’ uncanniness in the Iliad, why professors think students are getting dumber year after year, how the economic collapse of the ’70s led to improved colleges across the country, why he thinks Stoner is a study in self-pity, and more! Go listen! At Columbia since 1981, Professor Edward Mendelson has also taught at Yale and Harvard. A recipient of American Council of Learned Societies, NEH, and Guggenheim fellowships, he is chiefly interested in 19th-and 20th-century literature, formal and social aspects of poetry and narrative, and biographical criticism. He is Auden’s literary executor; his book Later Auden (1999) is a sequel to his Early Auden (1981). His book, The Things That Matter: What Seven Classic Novels Have to Say About the Stages of Life , was published by Pantheon in 2006. His new book is Moral Agents: Eight Twentieth-Century American Writers , from New York Review Books. He has edited a volume of essays on Thomas Pynchon and, with Michael Seidel, Homer to Brecht: The European Epic & Dramatic Traditions . He has prepared editions of novels by Hardy, Bennett, Meredith, Wells, and Trollope, the first five volumes of a complete edition of Auden, and selections of Auden’s poems and prose. His essays and reviews have appeared in the New York Review of Books, London Review of Books, TLS, the New York Times Book Review, and many other journals and collections, and he wrote an introduction for a new edition of Gravity’s Rainbow. He has also written about computers, music, and the visual arts. He is a Fellow of the Royal Society of Literature and was the first Isabel Dalhousie Fellow at the Institute for Advanced Studies in the Humanities at the University of Edinburgh. Credits: This episode’s music is Homesickness by Tsegue-Maryam Guebrou. The conversation was recorded at Mr. Mendelson’s office on a pair of Blue enCORE 200 microphones feeding into a Zoom H5 digital recorder. I recorded the intro and outro on a Blue Yeti USB Microphone . Processing was done in Audacity and Logic Pro. Photo of Mr. Mendelson by me.